through as to why they use they definition. sentence fragment with a single meaning all count as a 'word'. presented. They must all agree. no attempt to define a word or phrase with itself is allowed. violation here by which you undefine it. has defined the same word with different meanings. (7102) Science: a set of falsifiable theories. The philosophies of Karl Popper uses a definition quite similar to this and created the first use of 'science' in this way. Popper recognized that the use of the word 'science' by others often allowed for certain aspects of religion to be defined as science. For example, both religion and 'science' would use supporting evidence. Both religion and 'science' were essentially owned by some elite group. These problems, and others, inspired Popper to examine just what 'science' actually is and how it could be separated from religion. * that religion is not based on the ability to falsify its own claims or theories. Religions tend to be referencing only themselves as the source for the validity of their evidence. * that any theory of science can be tested to see if the theory is valid. Popper also understood that such a test, to have any meaning, must be specific and produce a specific result. Further, that test had to be available and practical to conduct. * that supporting evidence carried no ability to prove or legitimize a theory. Popper also realized that a single bit of conflicting evidence is enough to show a theory to be utterly false. * The branch of philosophy known as Phenomenology concerns the study of how people perceive some aspect of the world around them. This personal view of the world is different for each individual, and how it works is something that is predetermined by that individual. This means that any observation that such an individual makes, which must be an interpretation of the raw sensory inputs he receives, must therefore be interpreted by that individual's person model of the Universe, unique to that individual. This means that data, or the collection of data, is not in and of itself a part of 'science', since that interpretation would render 'science' redefinable by each individual, essentially undefining it. Therefore, data and data collection are NOT part of 'science'. * There is no elite group that blesses a theory to make it 'official' in any way. Such a group would effectively own 'science', including it's meaning. * There is no minimum number of people that have to agree on a theory. Such a concept would produce an elite group and is based on personal opinions of the group as a whole, essentially giving that group elite status. * A theory can be about anything, and can come from anywhere. They are thought up by one or two people. Throughout the history of what we call 'science', these individuals often went against the majority of opinion. Examples of this are Galileo, Michaelson and Morley, Kepler, and others. Between this reason and the immediately previous reason, consensus is not used in science. For that would form the elite groups as mentioned. * A theory is an explanatory argument, while an argument is a set of predicates and a conclusion. This makes the theory itself the sole supporting element of any theory. All that remains is to see if the theory holds true under adverse conditions. These tests form a basis of the falsifiable nature that is required of any theory of 'science'. These philosophies produce a consistent model and meaning for what 'science' consists of. According to the Global Warming mythology, Climate is the goddess overseeing the central planning and administration of all weather, ecosystems, and local climates across the globe, as well as all interactions thereof. According to the Global Warming mythology, a forcing is a miracle performed by Climate to effect the central planning and administration of all weather systems, ecosystems and local climates across the globe, as well as all interactions thereof. A feedback is a specific type of forcing employed by Climate that overcomes the physical limitations of the 1st and 2nd Laws of Thermodynamics by creating additional usable energy. Feedbacks come in various subcategories, e.g. thermal, climate, hydrostatic, radiative, etc.. According to Global Warming mythology, The Data is the rumored proof of Global Warming whose mere mention has the power to end all debate on the topic. According to the Global Warming mythology, greenhouse gas is a magickal substance (a gas) that has the superpower ability to cause any blackbody it contacts to violate the Stefan-Boltzmann law by increasing its temperature while decreasing its radiance. The miracle of greenhouse gas causing a blackbody to violate the Stefan-Boltzmann law. I would take issue with your definition of 'climate', as defined by Global Warming mythology. This same mythology also make use of the phrase 'climate change'. This would mean that such a goddess would therefore be always changing, effectively undefining the word. Thus, the use of 'climate' in this context is a circular one, effectively forming a strange loop. This word can be undefined according to Rule 5. I see no problem with the other definitions, since they are defined under Rule 7 by using a self referential dictionary of the Church of Global Warming. However, the Church of Global Warming itself has not spoken here. Any takers? A Holy link for isn't. Why? Because his Word Games are Word Crimes! Into the Night wrote: I would take issue with your definition of 'climate', as defined by Global Warming mythology. I could modify the definition of Climate to clarify that Climate Change is the "great mystery" by which the never-changing Climate is forever changing. Getting there, but first you would have to define 'climate change' which in turn would set up the same strange loop. Perhaps something akin to simply 'the great mystery'. Then 'climate' itself would be allowed to change. It is simply the 'great mystery' itself changing, which in itself is another 'great mystery'. That way, even the 'change' is a subjective thing and no longer needs to be quantifiable. I think we might even be able to reach a definition of 'climate change' itself! Stop. It's about time we clarified this. Climate never changes any more than the Christian God changes, or Zeus, or Vishnu, or any other unfalsifiable entity. She cannot change because She cannot be measured. The insistence by warmizombies et. al. that Climate does change is just one of the many contradictions built into the religion. I don't think any contradiction in the dogma should affect the description. So you are suggesting that the climate does form a strange loop and we should just leave it at that? That 'climate' is a Holy Contradiction, simply because its an object of worship? Hmmm. An interesting way to look at what the Church of Global Warming rests upon. Into the Night wrote:So you are suggesting that the climate does form a strange loop and we should just leave it at that? That 'climate' is a Holy Contradiction, simply because its an object of worship? Any Global Warming believer who has entered the clergy by having professed his/her faith in an officially recognized peer reviewed document. Upon being anointed, Climate scientists get to democratically vote on Climate Science and become part of the The Science consensus. Any element of Climate Science that runs counter to physics or is a logical fallacy, e.g. "Climate Change." The second highest calling within the Church of Global Warming is to embark on a pilgrimage to a Climate "ground zero" (normally near wherever the current Climate accord is being held) and to post one's homage to Climate on YouTube. The highest calling within the Church of Global Warming. The way for believers to achieve salvation for Climate, for humanity and for the planet by rejecting capitalism in all its forms through taxation of the 2nd Law of Thermodynamics. In the Global Warming theology, "heat" means whatever it needs to at the moment. The term is employed by Global Warming believers to shift semantic goalposts as necessary. It's meaning can shift fluidly between "temperature," "increase in temperature," "thermal energy," "flow of thermal energy," "convection," "absorption of electromagnetic radiation," "warmth," "energy," "infrared," "work," "power," "radioactivity," "electrical energy" and others as convenient. In the Global Warming mythology, the concept of an atom being filled to capacity with photons. All other photons will find no room at the inn and must look elsewhere. In the Global Warming lexicon, whenever an ordinary or otherwise non-exceptional event occurs that a Climate Scientist wishes to imply requires a Settled Science explanation, the event is characterized as "unprecedented." In the Global Warming mythology, being pronounced a superlative "of the instrument record" is a religious honor, akin to a title of sainthood, bestown upon an ordinary or otherwise non-exceptional weather event that becomes interesting trivia for having broken some record. In the firebrand preaching of Climate Science, the ardent belief that the average pH value of the ocean is somehow neutralizing. It also involves the strong denial that life is acidic and a fierce but unsupported belief that a decrease in ocean pH values would be detrimental, even catastrophic, rather than beneficial to marine life. In the firebrand preaching of Climate Science, the ardent but mistaken belief that the natural expulsion of algae by corals somehow involves bleach and somehow results in the destruction of the coral because of the coral's resulting white color. Neither is actually true as there are no caustic chemicals involved in the process and the algae eventually return, returning the colors to the corals. (7102) I noticed that no one from the Church of Global Warming is challenging your definitions. I noticed that no one from the Church of Global Warming is challenging your definitions. I ran this in parallel on the other board and not only is no one challenging them over there, I received several additional recommendations. Look up "teleconnections." Wikipedia lists this as "atmospheric science"! James___ wrote: Maybe they are too busy laughing at them? Whatever they are doing, they aren't challenging the definitions and they aren't offering any of their own differing definitions. I think we all know why not. Maybe they are too busy laughing at them? Why am I thinking about Laurel and Hardy for? (150) Hahahaha this is great, IBdaMann!!!! (3411) Per input on another board, this entry has been updated. p.s. - it might be related to their mathematical incompetence. A Global Warming edict and the Magna Carta of teleconnections, written in an unintelligible tongue speculated to be a Latin derivative, issued by Oracle from the Climate Change Holy Sea known as the "IPCC" and both prophecized and explains the current multi-decade haitus of Global Warming mythology. "A hypothesized low-frequency climate signal propagating across the Northern Hemisphere through a network of synchronized climate indices was identified in previous analyses of instrumental and proxy data. The tempo of signal propagation is rationalized in terms of the multidecadal component of Atlantic Ocean variability – the Atlantic Multidecadal Oscillation. Through multivariate statistical analysis of an expanded database, we further investigate this hypothesized signal to elucidate propagation dynamics. The Eurasian Arctic Shelf-Sea Region, where sea ice is uniquely exposed to open ocean in the Northern Hemisphere, emerges as a strong contender for generating and sustaining propagation of the hemispheric signal. Ocean-ice-atmosphere coupling spawns a sequence of positive and negative feedbacks that convey persistence and quasi-oscillatory features to the signal. Further stabilizing the system are anomalies of co-varying Pacific-centered atmospheric circulations. Indirectly related to dynamics in the Eurasian Arctic, these anomalies appear to negatively feed back onto the Atlantic's freshwater balance. Earth's rotational rate and other proxies encode traces of this signal as it makes its way across the Northern Hemisphere." Scientists are already working on translating this beautiful and mysterious language. An engineering marvel, typically equipped with the greatest threat to mankind...the internal combustion engine, and a large one. The piece is most often a vehicle, but can be a machine or even both. It's name is derived from it's reputation for consuming vast amounts of natural resources, as it is fully capable of burning 100+ gallons of carbon based fuel in a single day. As a vehicle, they are more commonly known as "SUVs". These SUVs can be quite costly, but also very useful, either as a luxury "go anywhere" vehicle, or put to work doing various tasks, aiding the average contractor to huge profits. As a heavy duty machine, these CO2 belching monsters can really impress. They are capable of seemingly unthinkable feats such as pushing right through a house, digging deep holes in minutes, or pulling 15,000 tons of coal down a rail at 60 mph. When used as a heavy machine, the fuel consumption can be astronomical, (200 gallons per hour) but the profits often reach the obscene category. GasGuzzler, you make a great point. In the Global Warming mythology, an SUV is a pornographically "unclean" vehicle wrought by Global Warming for His war against Climate. The SUV's seductiveness is extremely powerful over deniers. Using an SUV is a mortal sin unless approved by clergy for their own personal use. Inappropriate touching or oggling of SUVs is not to be permitted and children are to be warned at young ages of their dangers. (1107) I'd say you made my point better than I did. Yes, I forgot about the mortal sin without pre-approval. (7102) Unfortunately, you can't wash the 'unclean' nature off an SUV. It would be sort of like washing the dirt from the SUV and keeping the clean dirt. Climate Justice is the Global Warming penal code, akin to "Shariah Law" that holds as its core tenet that CO2, methane, water vapor and greenhouse gas are"vile," much in the same way fundamentalist Muslims view pork, and thus consider them to be both pollution and poison, to be outlawed and forthwith disposed/eliminated. This view is considered an imperative to prevent Climate from falling over the tipping point in Her war against Global Warming. In the Global Warming mythology, the term for wherever Climate is directly facing off with Global Warming. Global Warming believers make pilgrimages to such locations to see the fighting in action and to cheer on Climate, or if the battle has ended, to view the effects of the War. It's just a consolidated listing of what you have already seen here. ... oh, by the way, nobody has challenged any of it over there either. The Arch-villain of the Global Warming mythology; born out of unfettered capitalism, Global Warming acquires His power from "heat" produced by Greenhouse Effect. Global Warming is constantly at war with the goddess Climate,. His favorite weapons are CO2, methane, water vapor and greenhouse gas which he feeds to Greenhouse Effect in return for more "heat" and thus more power. The heroine of the Global Warming mythology,&nbsp;Climate is the Democratic People's Goddess.&nbsp; Born out of the Scientific Consensus, She oversees the central planning and administration of all weather, ecosystems, and local climates across the globe, as well as all interactions thereof. Climate is responsible for the care and well-being of all life on earth. In other faiths She is called Mother Nature. Note: Climate, by her nature, never changes but she is believed to be constantly changing, thus forming the grand mystery of the Global Warming faith.&nbsp; This is a core tenet of Settled Science. Non-believer; anyone who does not accept Climate Science. Deniers are analogous to orcs in the Lord of the Rings. According to the Global Warming mythology, a forcing is a miracle performed by Climate in discharging Her duties as the central planner and administrator of all weather systems, ecosystems and local climates across the globe, of all interactions thereof and in caring for the wellbeing of all life on earth.&nbsp; This falls under Climate Science. A feedback is a specific type of forcing employed by Climate that overcomes the physical limitations of the 1st and 2nd Laws of Thermodynamics by creating additional usable energy. Feedbacks come in various subcategories, e.g. thermal, climate, hydrostatic, radiative, etc..&nbsp; This falls under Settled Science. According to Global Warming mythology, The Data is the rumored proof of Global Warming, the mere mention of which has the magical superpower to end all debate on questions of Global Warming faith.&nbsp; Note:&nbsp; Often Climate Scientists fabricate data and claim that it comes from The Data.&nbsp; As long as the fabricated/cooked/tweaked/modified/fudged/altered/fiddled data support the truth of Climate Science then it is the Climate Scientists' duty to present that data.&nbsp; This duty is analogous to Taqiya in Islam. In Global Warming Settled Science, the point at which Climate will be forced to recreate the Christian "Great Flood" by the end of the century, i.e. oceans will rise 15 cubits, extreme weather will kill all life on the planet, there will be a big rainbow afterwards, etc.. The second highest calling within the Church of Global Warming; the embarking on a journey to a Climate "ground zero" (normally near wherever the current Climate accord is being held at that time), usually to post one's homage to Climate on social media. The highest calling within the Church of Global Warming. The way for believers to achieve salvation for Climate, for humanity and for the planet by rejecting capitalism in all its forms through taxing the very 2nd Law of Thermodynamics. In the Global Warming theology, "heat" means whatever it needs to mean at any given moment.&nbsp; The term is employed by Global Warming believers to shift semantic goalposts as necessary. It's meaning can shift fluidly between "temperature," "increase in temperature," "thermal energy," "flow of thermal energy," "convection," "absorption of electromagnetic radiation," "warmth," "cops," "energy," "infrared," "weapons," "work," "power," "radioactivity," "electrical energy" and others as convenient. This is another word for entropy, but is used within the context of society and business. It represents resources (usable energy) that are no longer available to the rest of life on earth per the 2nd Law of Thermodynamics. Since no business process can avoid externalities (because the 2nd Law of Thermodynamics cannot be avoided), the Global Warming Congregation embraces the Marxists doctrine that the only remedy for externalities is invasive taxation that flows money to the government and effectively kills capitalism. Externalities is a branch of Climate Science. Per the Global Warming lexicon, whenever an ordinary or otherwise non-exceptional event occurs that some Climate Scientist wishes to imply requires a Settled Science explanation, the event is characterized as "unprecedented." In the Global Warming mythology, being pronounced a superlative "of the instrument record" is a religious honor, akin to a title of sainthood, bestown upon an ordinary or otherwise non-exceptional weather event that becomes interesting trivia for having broken some obscure record. Teleconnection: noun In the Global Warming mythology, "teleconnections" are magickal links binding disparate ecosystems, placed there by Climate in Her central planning and administration of all life, nature, environments and climates on earth. A Global Warming edict, written in an unintelligible tongue speculated to be a Latin derivative, issued by Oracle from the Climate Change Holy Sea known as the "IPCC," prophesying and explaining the current multi-decade hiaitus of Global Warming mythology. Note on the Stadium Wave Prophesy: Scientists are already working on translating this beautiful and mysterious language. The belief among Climate Scientists that because Climate has assumed the role of central planner and administrator for all weather, climates, ecosystems and nature on earth that weather is no longer a random event and can therefore have trends. Otherwise there can be no trends in random events, e.g. weather, because the quality of being random precludes causal relationships required for trends.&nbsp; This belief falls under Settled Science. 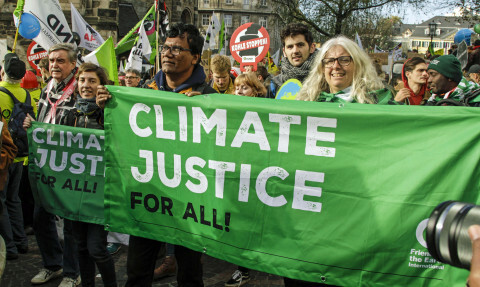 Climate Justice is the Global Warming penal code, akin to "Shariah Law" that holds as its core tenet that CO2, methane, water vapor and greenhouse gas are "vile," much in the same way fundamentalist Muslims view pork, and thus consider them to be both pollution and poison, to be outlawed and forthwith disposed/eliminated. This view is considered an imperative to prevent Climate from falling over the tipping point in Her war against Global Warming. According to Climate Science, one must believe the ocean is rising. This aspect of the faith is non-negotiable. The extent to which the ocean is rising, however, differs between warmizombies and skeptics.Warmizombies insist the ocean is rising at a catastrophic rate, denoting their belief in Global Warming's inevitable victory over Climate. Skeptics, on the other hand, insist the ocean is rising at a negligible, imperceptible rate, denoting Climate's complete control over all things in nature and their own certainty that Climate will always remain undefeated over Global Warming. Note on Sea Level Rise: Many warmizombies become stressed over this requirement of the faith because the ocean isn't actually rising, and they find it extremely difficult to somehow convince themselves that it is actually rising at a catastrophic rate. Such warmizombies fear the stigma of being perceived by their congregation as deniers so they often don't seek the help they need. For those with self-deluding difficulty, the Church of Global Warming has gathered a collection of church paraphernalia to help.